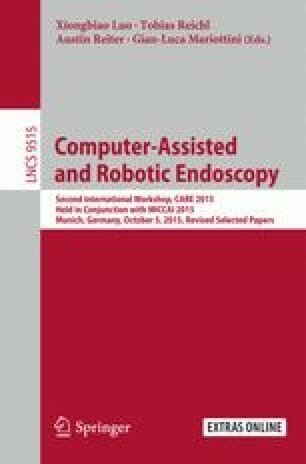 This paper describes a simple and robust algorithm which permits to track surgical instruments without artificial markers in endoscopic images. Based on image processing, this algorithm can estimate the 2D/3D pose of all the instruments visible in the image, in real-time (30 Hz). The originality of the approach is based on the use of a Frangi filter for detecting edges and the tip of instruments. The accuracy of the instruments’ location in the image is evaluated using an extensive dataset (1500 images, 3 laparoscopic surgeries). Pose estimation of instruments in space is quantitatively evaluated on a test bench through comparison with the ground truth positioning provided by a calibrated robotic instrument holder. This method opens perspectives in the real-time control of surgical robots and the intra-operative recognition of surgical gestures. The online version of this chapter (doi: 10.1007/978-3-319-29965-5_9) contains supplementary material, which is available to authorized users.